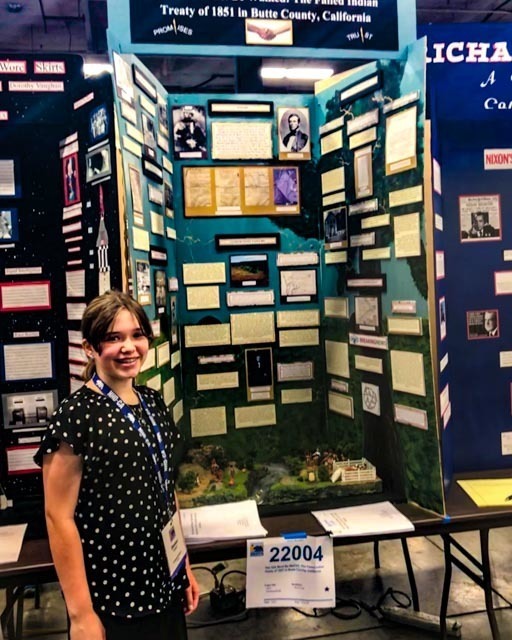 Congratulations to Emma Lund and Core Butte Charter for winning a statewide, National History Day Special Award for her entry: The Talk Must Be Walked: The Failed Indian Treaty of 1851 in Butte County, California. -- ROCKLIN, CA – May 6, 2018 -- After months of intensive research and success at district & county-level competitions, champions were recognized at the 2018 National History Day – CA State Contest. Sixty-two students will represent California at the National History Day competition in Maryland, June 10 – 14, 2016. More than 600,000 students nationwide participate in the year-long National History Day program. In California, more than 40,000 students participate in National History Day each year. This year, 1,466 students from 270 schools representing 27 counties participated in the California state contest. More than 240 historians, educators, and other professionals interviewed students and evaluated their work at the competition. Students were also awarded special prizes donated by sponsors. National History Day students engage in project based learning as they choose their own topics of study connected to an annual theme and then engage in public history at competitions. This year’s theme is Conflict & Compromise in History. National History Day students research historic documents and artifacts, conduct oral histories, search the Internet and libraries for information on their topic, and travel to historic sites. They present their work in a variety of ways including: museum-type exhibits, documentaries, websites, original performances, posters, or traditional research papers. Two educators were nominated for the prestigious NHD Harris History Teacher Award, a national award that honors teachers who engage History Day students in historical learning through innovative teaching and active learning strategies. Winners of this award will be announced at the NHD Awards Ceremony on June 14th at the University of Maryland.